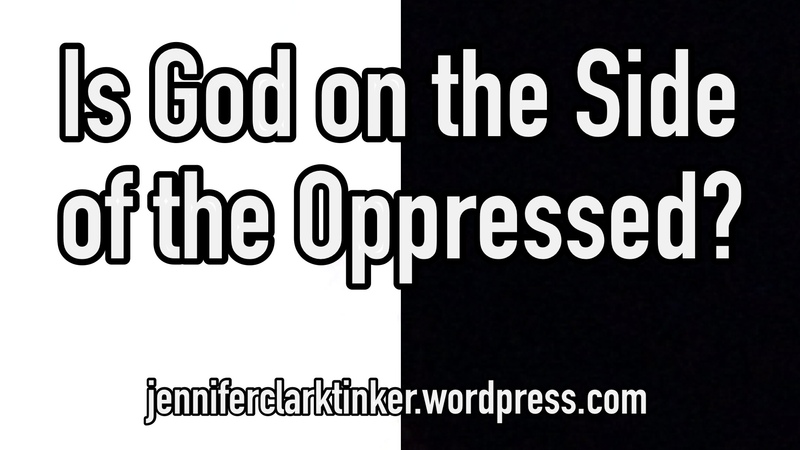 Is God on the Side of the Oppressed? God is always turning things upside down on us: greatest is least, lose your life to gain it, last will be first, caring about the least of these, and so on. As far as my brain can understand it, when it comes to power struggles, God is not interested in our human determinations about who “deserves” anything. As soon as we decide to pick favorites, God subverts our arrogant ordering and picks the opposite. The pecking order is not God’s idea though because God loves all people! But those who seize power are “feeling the love” in some way whereas the last-chosen are not. So God takes the side of those who are being dishonored–even to the point of dishonoring Godself to do it–because their needs for love, acceptance and whatever else are the least met. One tricky thing about the human pecking order though is that it can change on a whim when someone new seizes power or when those in power decide they want to give or take status. It’s like that one time when all of a suddenly a new Pharaoh came along who didn’t know Joseph, you know? So, who is “on top” in human pecking orders isn’t necessarily static–so God readjusts, because God doesn’t take kindly to any of God’s beloved people being oppressed. Also, our “place” in human pecking orders can vary from one group to the next. As a pastor’s wife in a small church and trained church worker, I’m a “big fish in a small pond.” But if I were in a very large church next door to a Lutheran college or seminary with lots of students and professors attending, I would be a relatively “small fish in a big pond.” I’m the same me, but my “place” would be different. Okay, lame example, because there’s not oppression involved, but you get the idea about different groups and different pecking orders. But, again, God readjusts and ministers to us at our point of need when we are feeling lowly. I don’t think any of us are all one thing–either always oppressors or always oppressed. And yet, I think we are all both capable of oppressing in more ways than is comfortable to admit and vulnerable to oppression in some degree or another. God loves us all the while—all of us, all the time, no matter what. But God is setting things right—dismantling our human pecking orders, welcoming the outcast, giving hope to the poor, washing feet, and all that. God is subverting our expectations with a prodigal love that won’t quit. Of course, the ultimate expression of God’s subversive love is through God’s coming to be one of us in the person of Jesus. Through Jesus, God embodied the most excellent way of love, love so selfless that Jesus didn’t even consider his divinity as something to be exploited, love so complete that Jesus endured suffering and death, love so powerful that Jesus rose victorious over death itself. And…God wants our partnership—to wash one another’s feet, to flatten the pecking order, to smash the patriarchy (I just love that phrase, so I had to throw that in there), and to proclaim the Good News of God’s love to all people. God calls us to align ourselves with God’s purposes, with God’s way of love. It is not easy and we can’t do it on our own because on our own those crazy pecking order ideas keep creeping up on us! Rather, the Spirit of God brings us to trust in the Good News of God’s love in Christ Jesus, and we are transformed by our victorious Lord to spread God’s love to all people. And so, in Christian freedom, we are called to serve the least of these and in so doing, serve Jesus. We are called to help the poor and oppressed, bring good news to the captives, love children, welcome the outcast and show God’s love in word and deed to everyone everywhere. We are called to live in such a way that we are Jesus to others, that they will know we belong to Jesus because of our love. So, yes, God is on the side of the oppressed when we start making sides. But God would rather us not make sides at all. And God would rather that none of God’s created people be either oppressors or oppressed. And God continues to work to draw us all to God’s side—to God’s way of love. There is something about a great body of water that draws me to it, draws me to God, draws me out of myself. I just look out at that lake and I see such power—something so much bigger and more powerful than I am. All of my cares—my worries—are eclipsed by the lake’s enormity. I don’t forget them but I see them in a broader context. I see I am not alone. Because also? 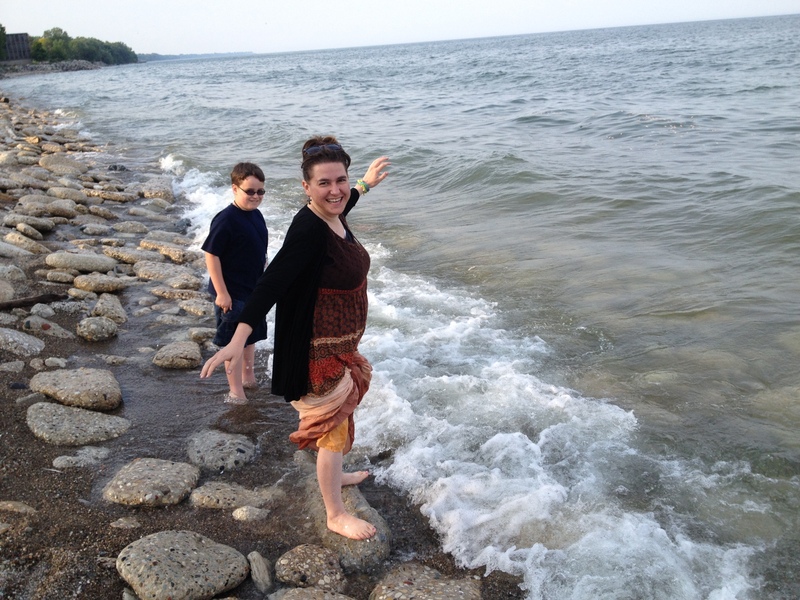 I know that the God who created that lake is even bigger—even more powerful—than that lake. And I know that God who is more powerful than the lake is also more powerful than my problems. In a way, this topic–the sanctity of life–is foundational to the entire series of receiving others as gifts. In fact, it is foundational to my entire life message and my worldview as a whole. I could’ve put this topic first and built out from there, but it is a bit tricky to write about. I mean, I can, with one post, alienate just about everyone with my thinking on this issue. I myself don’t even live up to my own high-minded ideals about how very sacred and precious life is. And so, I’ve buried this most-important topic in the middle of the series to work up the gumption to write about it. At this point, I don’t so much have more gumption as I have a sense of commitment to myself to write the whole series as planned. Basically, when it comes to the sanctity of life, I think it is a lot easier to want to protect some lives and disregard others. But if we take seriously that each and every person belongs to God as God’s precious creation, then we are challenged to hold as sacred the lives of all people. Let me give you an example. Sometimes I have heard people make a very impassioned case against abortion, yet those same people advocate for strict application of the death penalty. On the other hand, some people are pro-choice, yet staunchly opposed to the death penalty. For me, if life is valuable, then both the lives of the unborn and the lives of inmates on death row are valuable. Both abortion and capital punishment are serious issues and I do not mean to make light of either the complexities of an unplanned pregnancy or that of serious violent crime. What I mean to say is that I lament any loss of life. I figure if the good news of Jesus Christ is true, really truly true, then no one is beyond God’s love. Every life is worth saving in God’s eyes. But the sanctity of life in my mind goes beyond just the overt taking of a life. We demonstrate respect for life and undermine it in a million small ways every day. give dignity to the elderly. We undermine life when we neglect the above, abuse others with actions or words, infringe on others’ basic human rights, and more. These behavior undermine life because they violate others in some way. Whatever we do that violates others–even if they live through it–are offenses against their lives. In this broad extension of the idea of the sanctity of life, there isn’t a person I know that isn’t guilty of some violation of another. Myself included. Having this perspective doesn’t make me perfect. But I do believe it with all my heart and try to catch myself whenever I recognize that I’m in danger of causing harm to another. The good news is that we can begin anew each day. We can connect with our God who loves all of his created people and allow God’s Spirit to guide our words and actions as we receive others as gifts and honor the sanctity of their lives. In a previous post in this series on Receiving Others as Gifts I talked about not taking others for granted, that they are not objects for us to use. I want to go a step further with that to emphasize that people belong to God. The other people we encounter in life, as God’s beloved creations, deserve the respect that we give to God. In college I once wrote a paper talking about the importance of both loving God and loving neighbor. I wrote about these actions as if they were two separate realities. My professor pointed out that these are really two sides of the same coin. It simply doesn’t work to say we honor God when we dishonor God’s created people. Overtly acknowledging that others belong to God underscores that they do not belong to us. We serve alongside one another in mutuality and we give and receive meaningful companionship but others are free to give or withhold these as honors their own commitment to God. Others’ participation in service and companionship is not for us to coerce but for them to discern. It is important for us to honor their boundaries about what they are or are not willing to do. Another implication of others belonging to God is that many times we can learn from them about God. As each of us are designed by our creator to be in communion with him, sometimes others may be tuning in to God in ways that we aren’t currently. As such, we can glean insights and inspiration from their encounters with our God. Obviously, as a church professional married to a pastor I believe that there are formal roles in which this can happen. But a person does not have to be super religious or a trained professional to have encounters with God from which the rest of us can learn. It is easy to settle into our own views about and experiences with God. But God is at work in the lives of others too. Our lives can be enriched by remaining open to God’s movement in and through others. In my post about “giftedness” I talked about the idea that others are different from us. Whether we find these differences enjoyable or annoying, it is important to recognize that many of the differences among us are by God’s design. God created each of us as unique individuals. Our giftedness comes from God. Discrimination against or dismissal of others’ uniqueness is a failure to recognize God at work in each person. But by honoring their differences, we honor their belonging to God. By honoring others as God’s beloved creations, giving them the freedom to choose how they serve and with whom to associate, learning from them about our amazing God, and respecting their uniqueness we show a deep respect for them. In these ways we show with our actions that we embrace the idea that they do not belong to us, but to God.